A sweet romance, Serendipity fully commits to a single premise and makes the most of it. John Cusack and Kate Beckinsale find excellent chemistry and are extremely appealing as star-struck would-be lovers, their future guided by the quirky side of fate. 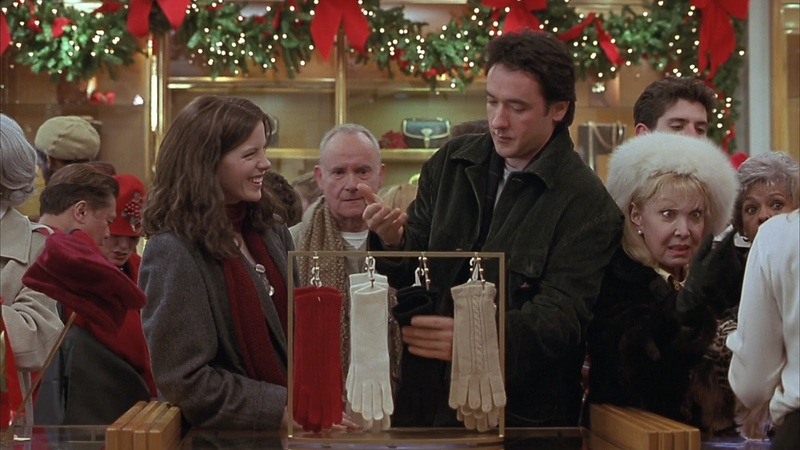 In New York City at Christmas time, Jonathan (Cusack) and Sara (Beckinsale) reach for the same pair of gloves at a department store. Although she has a boyfriend and he has a girlfriend, they are instantly smitten with each other and spend a few hours together, including sharing desert at an ice cream bar called Serendipity, and ice skating under the stars at Central Park. The magical evening is ruined by a devilish kid pushing all the elevator buttons at the Waldorf Astoria Hotel, and the couple are separated. Jonathan only knows Sara's first name, and is unable to locate her. Years later, Jonathan is engaged to Halley (Bridget Moynahan) and Sara has relocated to San Francisco and is engaged to musician Lars (John Corbett). But both are suddenly unsure of their chosen partners, and small clues prompt them to start looking for each other again. Jonathan recruits his best friend Dean (Jeremy Piven), a New York Times obituary writer, for a final quest to track down Sara, while Sara tricks her best friend Eve (Molly Shannon) to join on her on a trip to New York. With Jonathan and Halley's wedding day fast approaching, it's a race against time for the separated lovers to try and find each other again. Directed by Peter Chelsom as a piece of whimsy with a dash of humour sprinkled on destiny's mischievousness, Serendipity announces its intentions in the title and never wavers from playing with the theme of fate dropping little hints at all the forks in the road of life. With the final outcome never in doubt, the film is playfully built on the little coincidences and seemingly random happenstances that may be harmless trivia or a grand indication of what decision is next needed. An old Paul Newman film poster, a signed book given as a gift, an engagement ring that doesn't quite fit, a store receipt found inside a glove years after the purchase, a signed five dollar bill, a storefront converted to a bridal shop: little events could just be little events, or life-altering signposts urging a dramatic change in direction. The Marc Klein script cleverly keeps Jonathan and Sara in charge of all that they do in life. Fate is not imposed on them, but rather it provides them with what they need to reach their destination, or not, depending on how they interpret the available clues. The lovers spend most of the film apart, an often troublesome plot device. And the two central characters are barely rounded, with their occupations and lives outside the romance context barely probed. 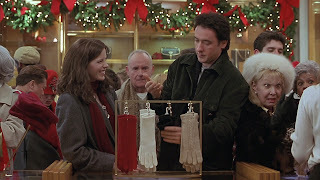 But John Cusack and Kate Beckinsale overcome the separation with dedicated performances that convey genuine longing and a profound belief that the few hours Jonathan and Sara spent together were an introduction to something much more meaningful. In support, Jeremy Piven and Molly Shannon do well to fill the void, providing Cusack and Beckinsale with foils to play against. Eugene Levy lets loose as a hilariously annoying store clerk who is both infuriating and helpful as Jonathan desperately tries to track down Sara. New York City at Christmas time and a soundtrack of romantic songs add to the film's charm. Serendipity never threatens to tax the intellect, but it does brighten up the heart with a satisfyingly warm glow.